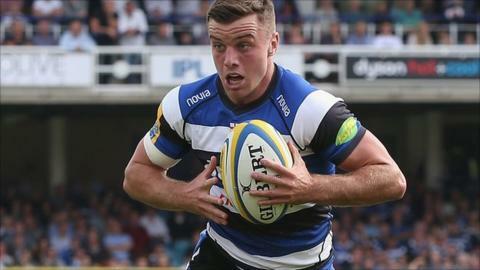 George Ford inspired Bath as they scored seven tries to beat London Welsh - who earned a four-try bonus point. Bath led 27-14 at the break with Chris Cook, Semesa Rokoduguni and Jonathan Joseph all crossing while Ford added three conversions and two penalties. Pete Browne and Seb Stegmann crossed for Welsh with Olly Barkley converting. Rokoduguni and Joseph scored second tries with Leroy Houston as well as Carl Fearns also crossing but Lachlan McCaffrey and Seb Jewell replied. Ford kicked a further three conversions while Barkley added one more on his return to the Rec as Bath earned their second victory of the new season. Cook was making his first start in the Premiership for Bath and needed only two minutes to score his first try, with the scrum-half finishing off a fine move which Ford converted. Welsh, who were thumped 52-0 by Exeter in their opening game last weekend, came firing back though and levelled when Browne crossed in the corner after Stegmann had created an overlap. Barkley converted but Ford soon helped the hosts retake the lead. First he sent over a penalty before releasing Rokoduguni to cross, with his conversion taking the score to 17-7. Bath had their third try when Joseph wriggled over after collecting his own grubber kick which Ford converted as they threatened to run away with the game. However, the Exiles showed great spirit and Stegmann bundled over from close range, with Barkley adding the extras for 24-14. Ford's penalty on the stroke of half-time gave them a 13-point lead and that became 20 soon after the restart with Houston driving over in the corner as Bath earned a four-try bonus point. Ford again converted for 34-14. Welsh earned their third try of the game with Stegmann's superb break finished off by Jewell, and Barkley converted. McCaffrey gifted Bath a try with an errant pass which was intercepted by Rokoduguni for a breakaway score and Ford's conversion sent Bath past 40 points as he maintained his 100% record from the tee. McCaffrey atoned for his earlier error to cross for Welsh after an overthrown line-out by Bath as the visitors themselves earned a four-try bonus point as the score moved to 41-26. Joseph scored his second of the game, with Ford again the creator but the fly-half missed the conversion so the advantage stayed at 20 points. Welsh conceded their seventh try for the second consecutive week as Fearns went over under the posts to give Ford a simple sixth conversion. Bath coach Neal Hatley: "To score 50 points against anyone in this league is an outstanding effort but to concede four tries at home is nowhere near good enough. "We are disappointed with the way we defended and we are going to have do a lot better over the next two or three weeks. "I think we lacked a bit of urgency in crucial areas. We had two or three opportunities for further tries but we didn't take them - and in this league you can pay the price. "But if you score 53 points you have got to be reasonably happy." London Welsh coach Justin Burnell: "We scored four tries and we were able to compete but it's coming back to the same old thing, unfortunately: four one-on-one individual errors - four tries. "That's nothing to do with systems, structures. I think we are more than capable of competing physically. "I would be concerned if we were getting destroyed in every other aspect. I don't think we are. We could have scored two more tries." London Welsh: Jewell; Stegmann, Reynolds, Molenaar, Scott; Barkley (capt), Weepu; Reeves, Morris, Vea; Browne, Down; McCaffrey, Thorpe, Stedman. Replacements: Vella, Cahill, Gilding, Corker, Pienaar, Lewis, Roberts, May.